The coating makes a difference. Selecting metal panels made from high-quality materials is essential to the longevity and success of any metal roofing system—from the steel sheets to the fasteners. Although the quality of the paint system applied to metal roofing panels provides an essential level of protection (as discussed in our recent ‘Decoding Your Warranty’ blog series), not to be overlooked is the coating used on metal roofing panels. Two coatings are commonly used on steel sheeting in the metal panel industry today: Galvalume® and Galvanized. Both products are manufactured to adhere to carbon sheeting and provide a barrier that resists corrosion and enhances long-term water-tightness and durability, ensuring resilience through damaging weather conditions. But what exactly are the differences between Galvalume® and Galvanized? Introduced into the construction marketplace by Bethlehem Steel in 1972 and now widely available around the world, Galvalume® is carbon steel sheeting coated with aluminum-zinc alloy by a continuous hot-dip process. Composed of 55 percent aluminum and approximately 45 percent zinc, this coating combines the best properties of both metals. It has the corrosion resistance, high temperature oxidation resistance and heat reflectivity typical of aluminum coatings, with the formability and galvanic protection of cut edges characteristic of zinc coatings. This combination makes it ideal for most types of roofing and siding. In addition, the coating also contains a small but significant amount of silicon in the alloy—not to enhance the corrosion performance, but to ensure optimal coating adhesion to the steel substrate when roll-formed, drawn or bent during fabrication. 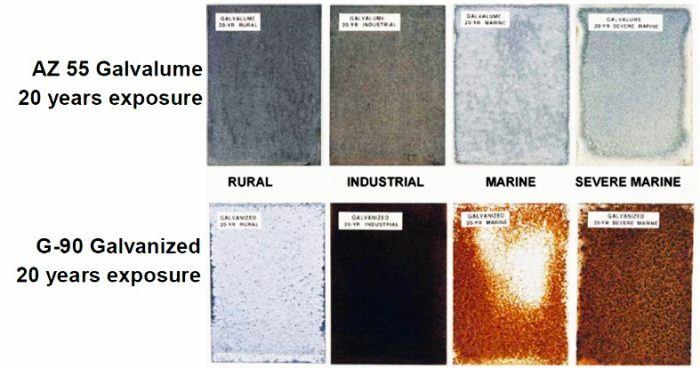 While both products were developed to essentially sacrifice themselves to protect the steel sheeting they coat, the above exposure comparison shows that Galvalume® performs (up to nine times) better in fighting corrosion as compared to Galvanized coating. While Galvalume® can initially show signs of corrosion faster than Galvanized, it has a sacrificial property that will prevent the corrosion from growing whereas once corrosion has started on a Galvanized panel, it can continue to corrode until panel integrity is lost. According to a study released by the Metal Construction and Zinc Aluminum Coaters associations, the longevity of a low-slope unpainted Galvalume® standing-seam roof is 60 years (See the full report.) Additionally, primer and paint adhere better to Galvalume®-coated panels and they carry a 20-year limited warranty while galvanized panels do not, making them a smarter long-term investment for homes, agricultural buildings or commercial properties. Galvalume® should not come in direct contact with: standing water, dissimilar metals (copper, lead, iron), harsh chemicals, graphite pencil, masonry products or treated lumber. Proper roof inspections and maintenance is still required, as with any other roof system. Its versatility, ease of use, aesthetic appeal and long-term, service life-extending performance makes Galvalume-coated steel roof panels the most economical and sustainable coating option for new and retrofit applications. To learn more about Galvalume®, please visit http://www.galvalume.com/. To view ABC’s Galvalume® Plus products, which are easy to form and install safely due to the thin, clear acrylic coating that allows them to be roll-formed dry without vanishing oil, please see our color resources and Galvalume® warranty information.